I have some sql dumps that I am looking at the differences between. diff can obviously show me the difference between two lines, but I'm driving myself nuts trying to find which values in the long list of comma-separated values are actually the ones causing the lines to be different. What tool can I use to point out the exact character differences between two lines in certain files? There's wdiff, the word-diff for that. On desktop, meld can highlight the differences within a line for you. I've used vimdiff for this. Here's a screenshot (not mine) showing minor one or two character differences that stands out pretty well. A quick tutorial too. grep -v if not interested in positions of the diffs. A ca t on a hot tin roof. workd="/tmp/$USER/$bname"; [[ ! -d "$workd" ]] && mkdir -p "$workd"
A cat on a hot tin roof. #+   then change \x02 back to \x20 for the final output. #+   to the keep the final display columns in line. wdiff is actually a very old method of comparing files word-by-word. It worked by reformatting files, then using diff to find differences and passing it back again. I myself suggested adding context, so that rather than word-by-word compare, it does it with each word surrounded by other 'context' words. That allows the diff to synchronise itself on common passages in files much better, especially when files are mostly different with only a few blocks of common words. For example when comparing text for for plagiarism, or re-use. This reformats file1 to the format of file2 and gives that to diffuse for a visual comparison. file2 is unmodified, so you can edit and merge word differences into it directly in diffuse. If you want to edit file1, you can add -r to reverse which file is reformatted. Try it and you will find it is extremely powerful! My preference for the graphical diff (shown above) is diffuse as it feels far cleaner and more useful. Also it is a standalone python program, which means it is easy to install and distribute to other UNIX systems. Other graphical diffs seem to have a lot of dependancies, but can also be used (you choice). These include kdiff3 or xxdiff. Using @Peter.O's solution as a basis I rewrote it to make a number of changes. It only prints every line once, using colour to show you the differences. It doesn't write any temp files, piping everything instead. Otherwise, if you use the original format (a single file with every second line needing to be compared to the one before) you may now simply pipe it in, no file needs to exist to be read. Take a look at demo in the source; this may open the door to fancy piping in order to not need files for two separate inputs too, using paste and multiple file-descriptors. No highlight means the character was in both lines, highlight means it was in the first, and red means it was in the second. The colours are changeable through variables at the top of the script and you can even forego colours entirely by using normal characters to express differences. paste -d'\n' "$1" "$2" | "$0"
The idea is to replace commas (or whichever delimiter you wish to use) with newlines using sed. diff then takes care of the rest. If I'm reading your question correctly, I use diff -y for this kind of thing. It makes comparing a side by side comparison much simpler to find which lines are throwing the differences. xxdiff: Another tool is xxdiff (GUI), which has to be installed, first. spreadsheet: For database data, a spreadsheet from .csv is easily made, and a formula (A7==K7) ? "" : "diff" or similar inserted, and copy-pasted. On the command line, I would make sure I add judicious new-lines before comparing files. You can use sed, awk, perl or anything really to add line breaks in some sort of systematic way - make sure not to add too many though. But I find the best is to use vim as it highlights word differences. 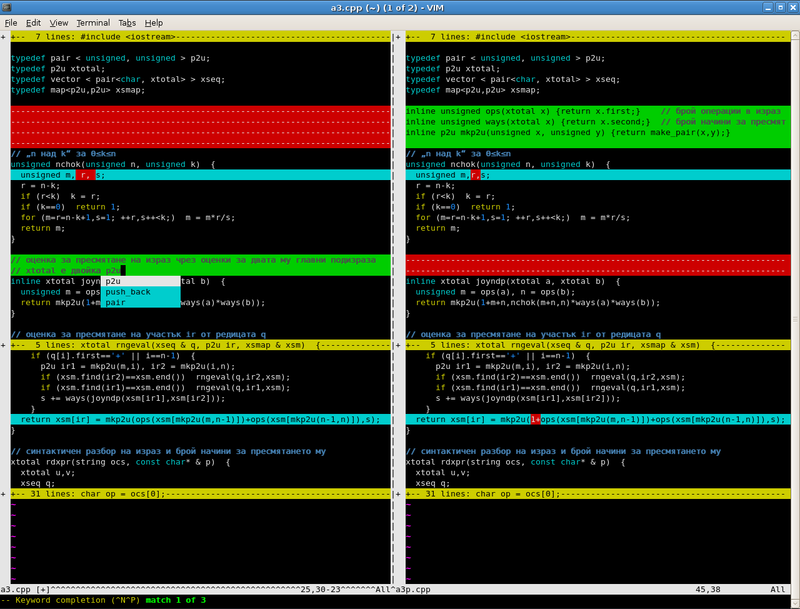 vim is good if there are not too many differences and the differences are simple. kdiff3 is becoming the standard GUI diff viewer on Linux. It is similar to xxdiff, but I think kdiff3 is better. It does many things well, including your request to show "exact character differences between two lines in certain files". I had the same problem and solved it with PHP Fine Diff, an online tool that allows you to specify granularity. I know it's not technically a *nix tool, but I didn't really want to download a program just to do a one-time, character level diff. Not the answer you're looking for? Browse other questions tagged command-line diff or ask your own question. How to use diff tool to take a diff between directories with libraries and source? How to diff files ignoring comments (lines starting with #)? Reading two files into an IFS while loop — Is there a way to get a zero diff result in this case? A combination of uniq and agrep? How shall I understand the unified format of diff output?